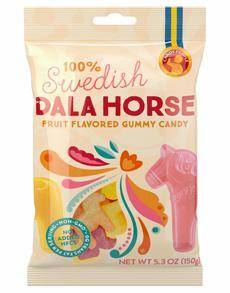  and  Swedish Gummy Horses, the best thing since Swedish fish (photos courtesy Candy People). 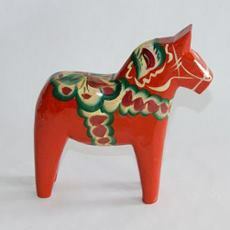 The painted wood horse that inspired the gummies (photo courtesy Scandinavian Butik). We love gummy candy. Our entire family does. That’s why it’s so easy to give them what they really want: different types of gummies, which, we might add, are pretty inexpensive. 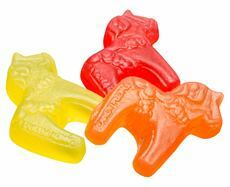 We found these luscious Dala Horse gummies at Ikea (in the store, but not online). We just put in a big order for more. The Dala Horse is inspired by the famed Swedish folk art, Dalahäst (Dala horse), a painted wood horse that originated in the early 1800s in the Dalarna Province of Central Sweden. They are still handmade there. At the time, the toy horses crafted in Dala began to be decorated with bright colors and painted flowers. The flower patterned saddle design derived from a Biblical story in which Jonah sat outside the city of Ninevah; the Lord caused a kurbit, or gourd vine, to grow up beside him to protect him from the desert sun. The Dala Horse gained worldwide recognition at the 1939 World’s Fair in New York City, where a giant version welcomed visitors outside the Swedish Pavilion. The following year, 20,000 Dala horses were produced for shipment to New York. BUT WHAT ABOUT THE CANDY? Dala Horse gummy candy is imported from Sweden. We like them even more than Swedish Fish. Pineapple, citrus, and raspberry, in natural colors and flavors. Gluten free, gelatin free, GMO free, HFCS free. Sold in 5.3 ounce bags. Great stocking stuffers: 3 bags are $13.95, 6 bags are $23.95. But we went whole hog (actually, whole horse) and bought the 15-pack for $49.95, $3.33 a bag. In addition to holiday tips, we’ll be gifting everyone gummy horses, with a bow tied through the opening at the top. Dala Horses are sold at all Ikea and World Market stores (in-store only) and online at Amazon.com (links above). Check out the Chocolate Covered Gummy Bears and Worms from Baron Chocolatier. Heaven!